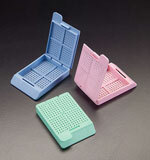 These UNISETTE™ disposable tissue processing/embedding cassettes are made to keep specimens submerged in liquid and are uniquely resistant to the chemical action of most histological solvents. 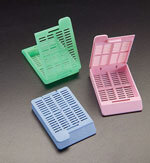 Each tissue processing cassette was molded from a high density polymer and was designed with several flow-through slots, which allows for proper fluid exchange and easy drainage. The UNISETTE™ is a single component tissue processing cassette and the attached lid snaps into place, safely latching to the base of the cassette and eliminating any concern for specimen loss. 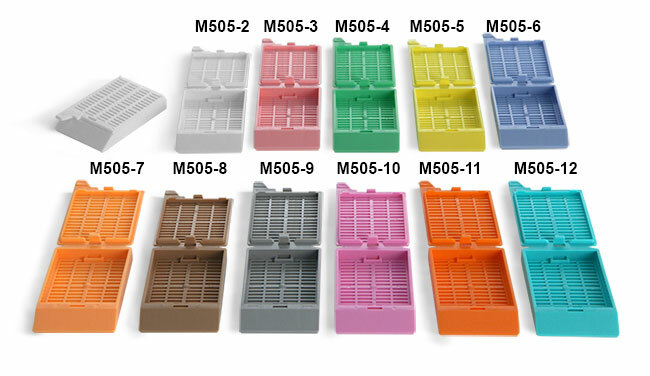 The M506 series is similar to the M505, except that the M506 is specifically designed to hold biopsy specimens during the embedding process. 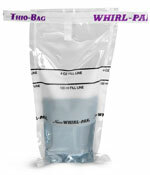 Try these disposable processing cassettes in one or more of the 11 non-cytotoxic, non metallic colors. Each SP option (500/cs) is neatly packaged with 500 cassettes in one small box, while the bulk options (1,500/cs) contain 3 boxes of 500.